Hey guys, happy weekend!! I’ll be brief today as it’s late and I still have heaps to do. I’m giving a talk at the Stroud Vegan Fair tomorrow morning and instead of preparing, I’ve spent the last 10 hours shooting pancakes! I started off with savoury pancakes that I was planning to shoot today, but things just kept on going wrong, so I’ve had to abort mission or else there would be no recipe this Saturday. 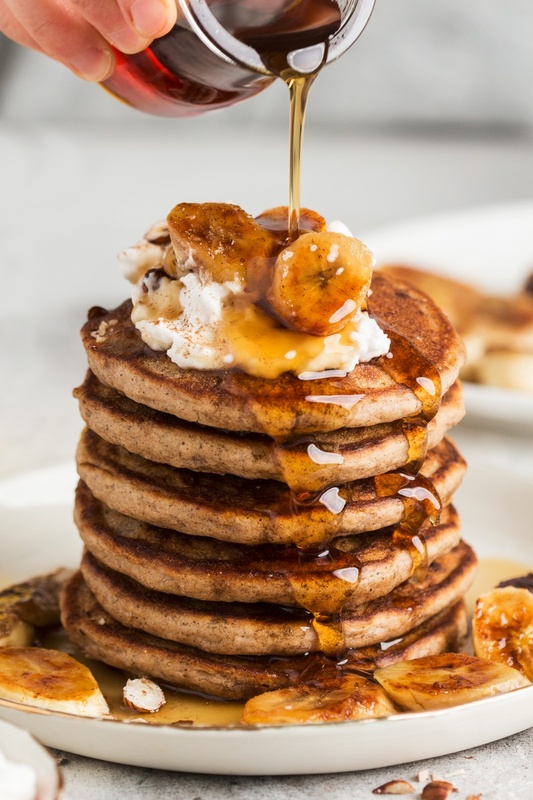 I had a good look around the kitchen and at my notes and one other recipe I completed recipe testing on before I went on holiday was banana pancakes. 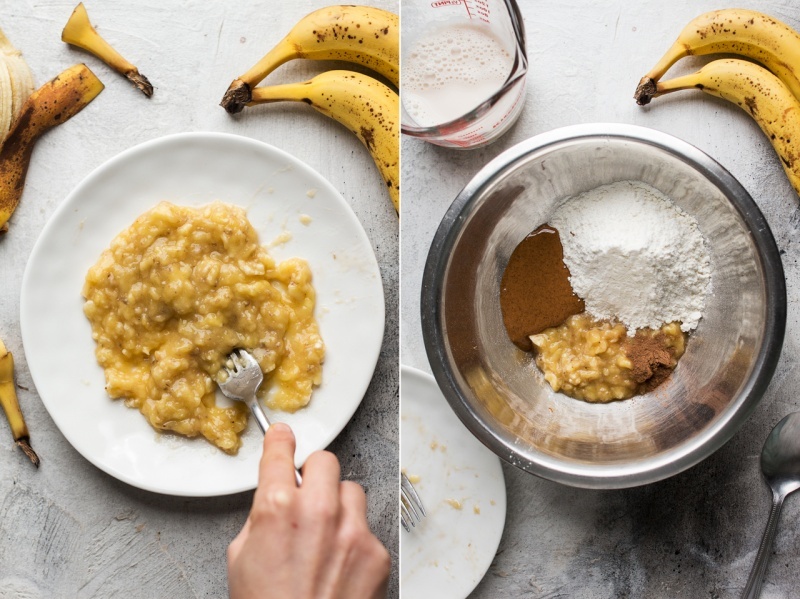 I happened to have lots of bananas and not much else, so I’ve decided to shake things up and do an emergency banana pancake shoot. All was well, the pancakes came out great and I was making very good progress until it got to the final, showcase, shot that I could not get right for…4 hours! I am not kidding. I have no idea what the hell happened? I guess I was tired, shooting for 10 hours is no joke and I was getting progressively more stressed as I kept on messing up all of the takes, knocking things over and spilling stuff. The realisation that I will be public speaking (which I always dread!) in a few hours from now and I still haven’t memorised my talk enough, was stressing me out. Eventually, I managed to get a final shot. Phew! So I shall leave you with this fluffy banana pancake recipe, while I go off to talk to myself some more 😛 . 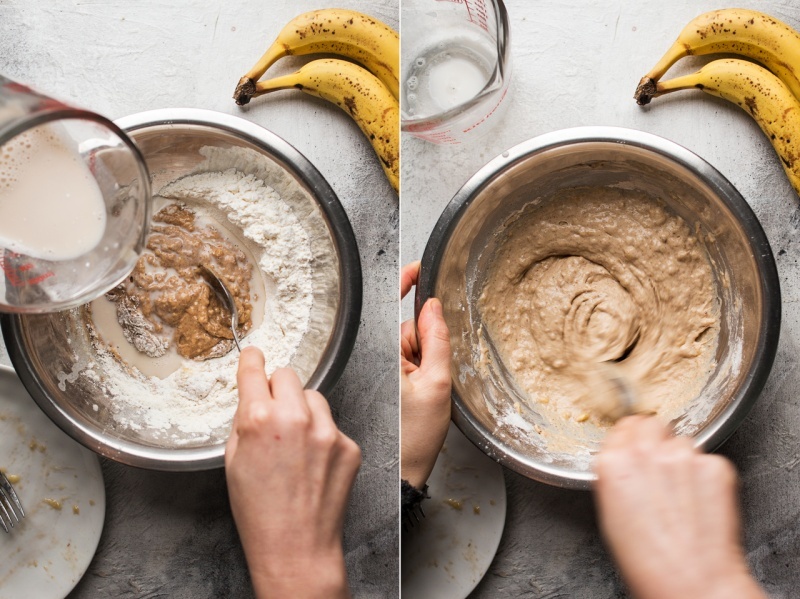 PS: If you make my vegan banana pancakes, don’t forget to tag me on Instagram as @lazycatkitchen and use the #lazycatkitchen hashtag. I love seeing your takes on my recipes! In a large mixing bowl, combine mashed up bananas, nut butter, lemon (or lime) juice and cinnamon. Since I used gluten-free flour, I added it in at the same time, but if you are using flour that contains gluten, it is best to add it in at the end. Finally, mix in flour, baking powder and baking soda. You may need to add another tablespoon of milk at this point to achieve the right (thick but spoonable) consistency. Heat up a medium non-stick frying pan on the stove, but be careful not to get the pan too hot as the pancakes will burn before cooking in the middle. Brush the pan with a bit (I found that ½ tsp is enough if you’re using a non-stick pan) of oil using a silicone brush. Ladle scant ¼ cup of the pancake batter per pancake. Cook each pancake for about 2-3 minutes (until tiny bubbles appear on the surface and burst) on one side and then flip. Cook for 1 minute on the other side. 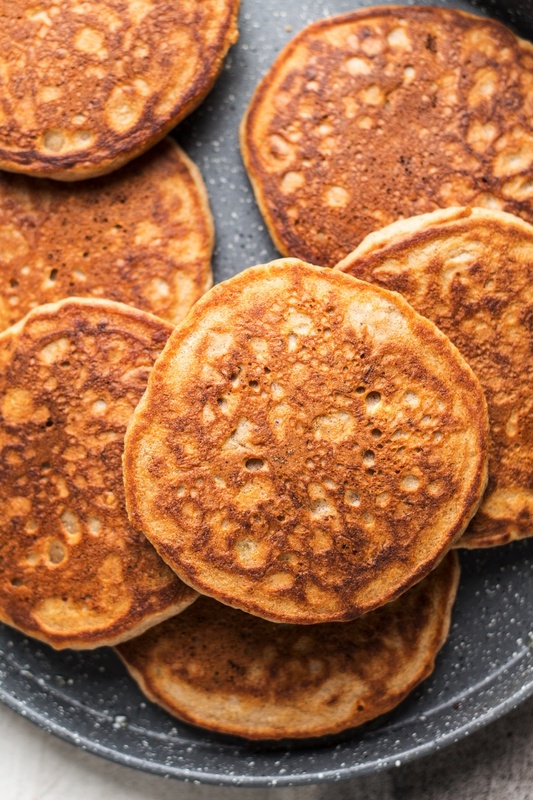 Keep the cooked pancakes in a stack in a warm oven while making the rest. Serve with caramelised bananas, maple syrup, chopped nuts and a dollop of vegan yoghurt if you wish. Brush or coat sliced bananas in maple syrup or stem ginger syrup (that’s what I used) and place on a warm pan. Allow one side to caramelise on a gentle heat. Once golden brown, flip the slices to the other side and let them caramelise too. Once caramelised, take the slices off the pan gently and set aside until the pancakes are cooked.